Ollydbg plugin development: Findmemory needs Listmemory? Here is the story of a problem I had yesterday using Ollydbg exported function Findmemory. If the function succeeds, the return value is a pointer to the descriptor of memory block to which this address belongs. If it fails the return value is NULL. Useless to say I got a lot of negative results, but the memory block containing the address I passed to the function exists in memory map output produced by Ollydbg. That’s the problem! Three windows representing: the code inside the allocated memory block, all the memory blocks inside memory map window and the log produced by my script. As you can see the block inside the red selection exists but seems like it’s not inside the memory list scanned by the above snippet. There are some discrepancies between all the memory blocks because most of them are deallocated/allocated but the 30000/31000 memory block still exists in memory, so the question is: how is it possible? Well, this time the memory block was found! I don’t know exactly what’s the purpose of the function, and I don’t know if this method represents the right way to solve my problem, but if you want an updated memory list I suggest you to try to call Listmemory. I haven’t searched through the net a lot, and I haven’t seen a single page related to this problem. If you have some more information about Listmemory I’ll gladly exchange opinions about it. There are some nice tutorials about malicious Office documents around the web, but as far as I’ve seen so far I dealt an unusual method to hide the shellcode. Great tools like OfficeMalScanner and others are unable to handle this particular scenario, so here is the story of my adventure inside this RTF file. The first bytes of the file tells me something about the content. It’s a common header for a RTF file document. First of all I tried using RTFScan (which is part of OfficeMalScanner) without luck. The scanner tool is able to recognize an OLE document followed by an object data but it fails to retrieve a possible shellcode from it. I rapidly decided to put my hands inside the file inspecting the content of the document with an hex editor. 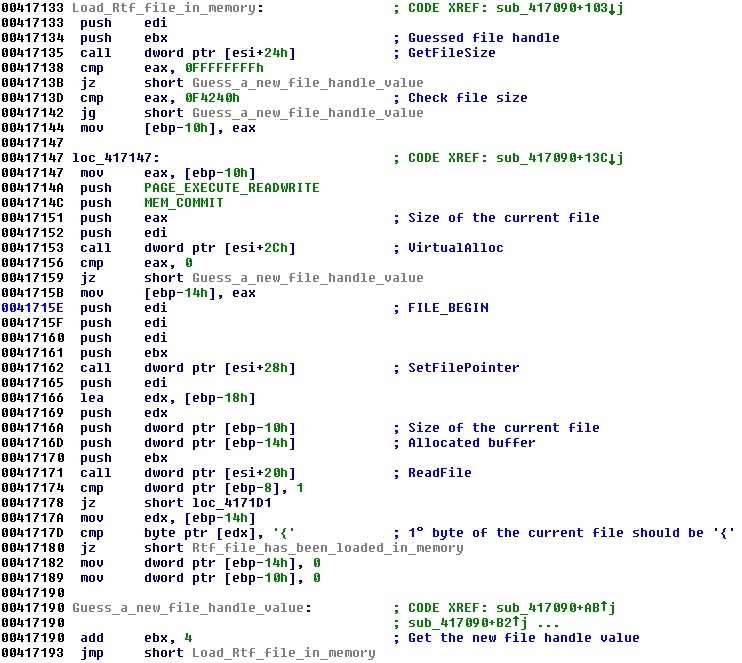 The aim of the analysis is to find the shellcode which is executed once the exploit occurs. Looking at the bytes sequence I tried to locate some clues (i.e. a sequence of 0x90 bytes), but I failed miserably. Seems like there’s no trace of particular piece of code resembling a shellcode. Doing so the size of the file has been reduced a lot but there are still many bytes to check so I decided to proceed investigating around the OLE definition, you can easily locate it searching for D0 CF 11 E0 bytes sequence. Converting the sequence “4D53436F6D63746C4C69622E4C697374566965774374” to byte sequence you’ll get the string “MSComctlLib.ListViewCt”. I’m almost sure the exploit takes advantage of an old vulnerability in mscomctl.ocx (cve-2012-0158) to execute arbitrary code but as far as I remember it should be “MSComctlLib.ListViewCtrl.2“, where are the other letters? I need ‘r’, ‘l’, ‘.’ and ‘2’. The answer is inside the “\bin” definition following the incomplete string. The keyword is used to specify a sequence of bytes in hex format, in this specific case the number of byte is 4. The 0x20 byte follows the keyword and it’s not part of the 4 bytes. So, the defined bytes are: 72, 6c, 2e, 32 and they form the substring I need: “rl.2”. After these bytes and before the next bin definition there are some more bytes, they are not in the hex format and they don’t really represent the string “00000000”. They simply are the bytes sequence 00, 00, 00, 00. This mix of binary and non-binary defined bytes represents the flaw of the entire idea used to hide the shellcode. I’m not good with graphic tools but you should get the point. The shellcode is obfuscated inside bin keyword declaration. Two opcodes of the shellcode are taken from the hex bytes inside “bin”, and the other two are right after the bin definition. I’ve finally found out the shellcode! I don’t know how automatic recognition tools are done, but I can now imagine why they are not able to identify suspicious instructions using specific signatures. It gets the address of the necessary functions that are used inside the shellcode. They are all from kernel32 dll. It doesn’t need anything else. The content of the RTF file is entirely loaded inside a dynamic allocated buffer. To better understand this snippet you should try imagining the right scenario: a vulnerable machine runs the RTF, the exploit occurs and the shellcode will be executed. The RTF is already opened, so the file handle already exists and it’s a concrete value. The shellcode author tries to guess the right value of the file handle. That’s why there are some checks inside the snippet, he/she wants to be sure he’s loading the right file. It’s pretty easy to understand this part of the code directly from the dead list, but if you want to proceed reversing the shellcode a debugger is almost necessary. Why? Well, the decrypted malicious file contains a snippet that is called directly from the shellcode. Now I can debug everything like in a real environment. Back to the analysis, the RTF file in memory is decrypted using an algorithm (it’s not a single xor operation but it’s not interesting per se). There’s not much to say about the last part of the shellcode, the most interesting thing is the fact that part of the shellcode is inside the decrypted RTF file. It’s really hard to get the entire shellcode from the malicious document; you may can use a static tool but you sure have to decrypt the file. Here is the last task of the malicious document, the most important for a malware author, the infection. Two files are created, the first one is the malware and the other one is just a clean document. Both of them are created inside the temp directory, the malware has a random temporary file name and the document has a fixed name “cv.doc”. Looking at the list of functions obtained from kernel32.dll by the shellcode you can predict the sequence of functions used to create the two files (GetTempPathA – GetTempFileNameA/lstrcat – CreateFileA – WriteFile – CloseHandle and WinExec). Once created, the malware is immediately started using WinExec. The same function is used to show the content of the cv.doc file calling winword as a reader. The doc file is a clean version of the malicious RTF file, it does contain the OLE part but the “\object\objocx” section is not inside the file anymore (the exploit/shellcode part has been cutted off). That’s the content of the fake file, the one used to show something on the screen. According to Google translation it should be the word “Instructions” but I don’t care much about the meaning of it. That’s all for now, I’ll blog about the malware analysis in a future post, stay tuned!